The changes brought by industrialization have had a great impact on women’s lives both domestic and occupational. New technologies have changed work at home and created new opportunities for work outside the home. Traditionally clerical work was assigned to young men in offices and was considered an apprenticeship toward a business career. By the late nineteenth century women were starting to take on this work but without hope for advancement. 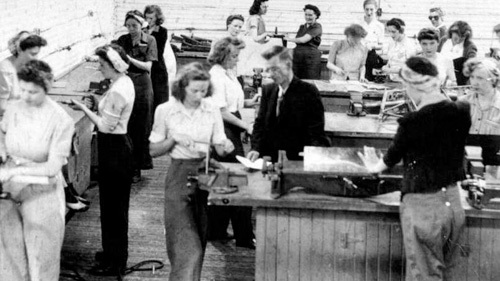 Women answered the call to factory work in both world wars. The Museum has collected material like photos and personal artifacts from women who worked in wartime industry in Pictou Co. This is reflected in our exhibit galleries. Changing technology in the home from cast iron pots to electric ranges has had a significant impact on women’s work at home. The “labour saving devices” brought in by the arrival of electricity may have reduced the heavy lifting component, but also raised the bar for domestic perfection. This is an area in which we would like to build our collection as more and more women enter trades previously dominated by men.